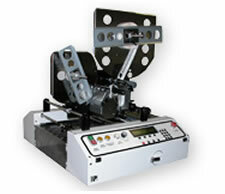 Fast and versatile, these top-of-the-line, high-end tabletop labelers/tabbers machine handle up to 35,000 pieces/hour and up to three tabs in one pass. They apply clear, translucent, or paper tabs with ease in a variety of tab sizes and can apply up to 4” wide. An innovative side tab application allows maximum productivity – simply load large tab rolls and jobs keep running. Production speeds of up to 35,000 pcs./hr. ; double tab at 30,000 pcs./hr.